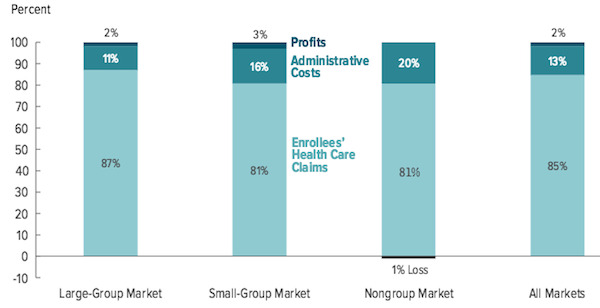 Notes: The small-group market generally serves employers with up to 50 employees. A fully insured plan is one in which the insurer bears the risk; that is, the insurer incurs the added costs if expenditures are higher than expected and keeps the savings if expenditures are lower than expected. Data Source: Congressional Budget Office, using 2010 filings of the Supplemental Health Care Exhibit (National Association of Insurance Commissioners) and 2011 and 2012 filings of the Medical Loss Ratio Annual Reporting Form (Centers for Medicare & Medicaid Services). This entry was posted in Data Watch on February 24, 2016 by Genevra Pittman.